Insurance policies provide financial security to individuals in case of undesirable circumstances such as an accident, illness or death. According to the conditions of the specific policy, the policyholder has to pay a certain amount of money on a regular basis. The insurance company is authorized to cancel the policy in case the policyholder neglects this payment or fails to fulfill the terms and conditions because of any reason. However, before the cancellation of the policy, the company sends a reminder letter to the client. 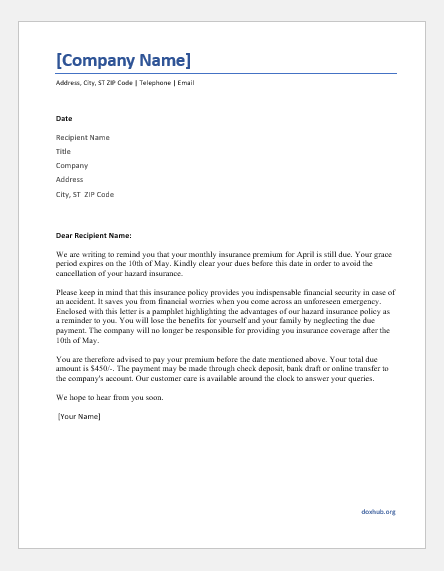 The purpose of this letter is to inform him that he may end up losing all coverage provided by his insurance policy in case of further delays in the payment. In this way, the company provides another chance to the policyholder to clear the dues. This is important for retaining the client as well as for strengthening the business relationship with him. The insurance company is not going to have any personal gains in case of cancellation of the policy. In fact, it will only end up losing one of its clients. Therefore, it is very important to send out this letter before proceeding with the cancellation process. It does not only remind the policyholder about the due payment, but also highlights the benefits of his particular policy. This letter is an effort to persuade and convince the client to retain his insurance instead of giving it up. The following tips explain how to write a letter in order to notify a policyholder that his policy shall be cancelled due to non-payment of the due insurance premium. The letter begins with a reminder about the due payment. In some cases, this letter may be sent a few days before the last date of the payment in order to provide a timely reminder to the client. On the other hand, some companies also provide a grace period after the due date has passed. Mention these dates in the letter and emphasize the importance of clearing the dues within the provided time period. While making this reminder, keep the tone professional and polite. It is advised to be straightforward and clearly mention that the company demands timely payment. One obvious consequence of the client’s failure to pay the premium is the cancellation of his policy. Make it clear to the policyholder that the company will be taking this action in case he still neglects the payment despite this reminder. Moreover, you should also notify him about the subsequent results of this cancellation. Inform him that he will lose the coverage and financial security provided by the insurance policy. The client cannot make any claims once the policy has been cancelled. A client who has been neglecting the due payment needs to be reminded about what advantages his insurance policy holds. Re-emphasize all the benefits so that you can make him aware of what he is going to lose in case the company cancels the policy. Additional literature providing details about all the benefits may be attached with the letter. At the end, provide direct instructions to the client about clearing the dues immediately. Mention the last date of paying the premium and remind him about the mode of payment. We are writing to remind you that your monthly insurance premium for April is still due. Your grace period expires on the 10th of May. Kindly clear your dues before this date in order to avoid the cancellation of your hazard insurance. Please keep in mind that this insurance policy provides you indispensable financial security in case of an accident. It saves you from financial worries when you come across an unforeseen emergency. Enclosed with this letter is a pamphlet highlighting the advantages of our hazard insurance policy as a reminder to you. You will lose the benefits for yourself and your family by neglecting the due payment. The company will no longer be responsible for providing you insurance coverage after the 10th of May. You are therefore advised to pay your premium before the date mentioned above. Your total due amount is $450/-. The payment may be made through check deposit, bank draft or online transfer to the company’s account. Our customer care is available around the clock to answer your queries.